The Oil States Diverless Repair Clamp (DRC) is a mechanical, split-style clamp for deepwater pipeline repair or recovery operations. The multi-purpose clamp can be configured to serve as part of a spoolpiece repair system, a leak repair clamp or as a recovery tool. The inboard sealing system reduces the pressure envelope and creates a shorter sealing length. This feature, coupled with the collet grips on the outboard side of the sealing envelope, yields a better seal performance. 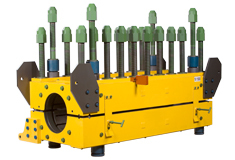 A vertically positioned running tool actuates the seals and grips simultaneously, and also runs two body bolts at the same time to increase the efficiency of the repair operation. The running tool can then be retrieved for other projects or can be used on other Oil States products such as the SureLock diverless end connector. Standard Viton seals, reversible collet grips and annulus test feature. Full-pressure, end-load and structural reinforcement. Reduced pressure boundary and seal length. Fast, reliable single-set grip and seal actuation. ANSI Pressure Classes 300 through 2500, API 6A Pressure Ratings 2000 through 5000 (6B) and 2000 through 10000(6BX).